We are located at 19 Lake Drive, Mansfield, Illinois, 61854. From Interstate 74 Exit 166, turn South and proceed to the first street, North Street. Turn RIGHT and proceed to the second right, Washington Street and turn RIGHT. Go one block to Lake Drive and turn RIGHT. The studio is the first driveway on the right side with the white picket fence. 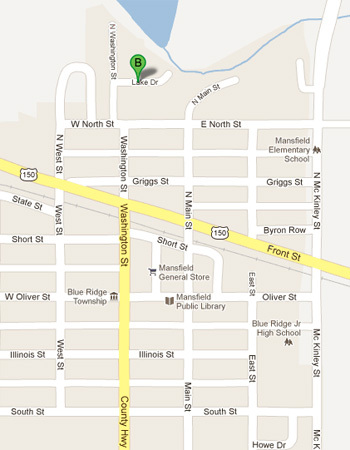 For a map to our studio, use GOOGLE MAPS and use 19 Lake Drive, Mansfield, IL 61854 as your search address. Other map services may give incorrect results.